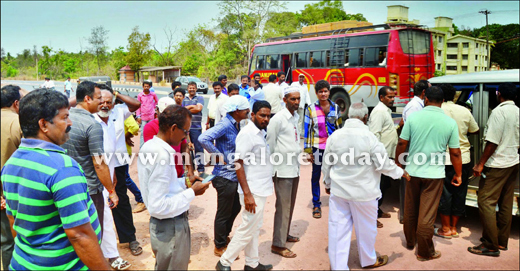 Mangaluru, Mar 19, 2015: An attempt to set up a much opposed toll gate near the NITK-Suratkal was once again foiled by the local Nagarika Vedike activists on March 18, Tuesday. It is learnt, machinery had arrived at the spot to dig the ground, reportedly to facilitate construction of a toll gate.Some people who arrived by a car were also at the spot. The Vedike members who got hint about this rushed to the spot and tried to stop the works , when a heated argument ensued between them and those who were present when the works were underway. There would have been a virtual fist fighting had not the Suratkal police arrived at the spot in the nick of time. It is learnt, the men soon fled the scene in the car in which they had arrived. Meanwhile, there is information that the works may soon kick start with police help. Sources have revealed that the contract for toll gate construction has been bagged by a Dharwad person and a sub-contract given to a person reportedly affiliated to some Hindu organisation. It has also been gathered that a leader who was earlier supporting the agitation against the construction of tollgate has reportedly gone back on his words.